In group living vertebrates social conflicts are among the strongest stress factors affecting physiology, behaviour, fertility and the immune system of the single individuals. Recent integrative studies provided interesting insights into the complexity of social phenomena and their relationships with further ecological factors such as biological rhythms or the efficient digestion of food resources. Such activity and behavioral patterns are adapted to circadian and circannual rhythms, however they show a certain plasticity with respect to social context. The main research objective of the project is the investigation of the relationships between activity patterns and social behaviour, i.e. 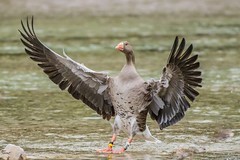 the modulation of the activity patterns by the social context in a highly social and long-lived vertebrate, the greylag goose (Anser anser), which can be considered as a model for social systems. The focal animals of the project belong to the free-living and individually marked flock of the Konrad Lorenz Research Station (KLF) in Grünau im Almtal (Upper Austria). The social relationships of these birds have been monitored since 1973 and the animals are well habituated to the close presence of humans. Additional physiological information on nutrition efficiency as determined by dropping analysis will supplement the integrative research approach on activity patterns, social behaviour and reproductive success. With this respect, preliminary results indicate different digestive efficiencies depending on the social category (parental individuals show higher efficiency than unpaired ones or paired without offspring). The KLF claims the necessary expertise and the relevant scientific networks to collect and analyse this complex data set, such as the cooperation with the University of Udine (IT) and the Anglia Ruskin University (UK). Furthermore, the project includes MINT issues for the female students of the BG / WRG "Körnerstrasse" in Linz, who will present their experiences within the project at the Cambridge Science Festival. Three grades of the primary school of Grünau im Almtal will also participate into the project, by joining the survey of the time-space pattern of the greylag geese and by acting as multipliers for the further focus on Citizen Science. In fact, volunteers (citizens) will be invited to participate in the data collection too, by advertising the project on further information channels (i.e. social media, internet platforms). The manifold of actors and tasks involved in the project crowns the long-term cooperation of the KLF with several regional educational institutions providing at the same time the basis for further research projects.